The Canola Council of Canada has a new video describing swede midge, its life cycle and the damage it can cause canola crops in Western Canada. The video also mentions the new midge that is similar to but distinct from swede midge. The 11 Canola Council of Canada agronomy specialist have set individual priorities for their 2017 communications. Here is your chance to identify the agronomist for your region and see the focus areas for the whole team. Growers in the short-season zone will consider days to maturity (DTM) of a variety. Those in counties with clubroot should strongly consider a clubroot resistant variety. 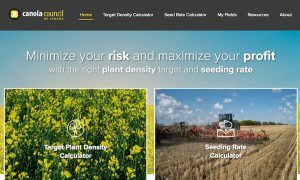 Queries on the Canola Performance Trials website can help growers consider these and many other factors when selecting a variety. Weather conditions are rarely the same two years in a row. That is why making decisions based on the snow-extended harvest of 2016 may not be the best economic choice for 2017. For example, seeding a short-season variety in April to avoid another potential September snow fall may not match up with the most probable growing conditions and profitable decisions for the area. What to do with canola still out there? Spring harvesting is the best way to remove canola still in the field. Quality will likely be down, but it will still be worth something. Growers may think of alternatives, but they’re probably not as economical. Each Prairie province does its own disease survey most years. The Manitoba Canola Disease Survey has been happening for over 15 years and tracks a variety of diseases. 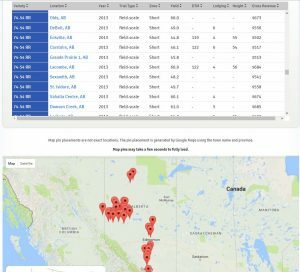 Alberta’s survey the past few years has mainly been focused around monitoring the spread of clubroot. Blackleg results are based on prevalence, incidence and severity — but what do these words mean? canoLAB has moved to new regions for 2017 and spots are filling up. Day 1 in Regina next week is SOLD OUT. Secure your spot today.